The host of heaven and the angel of the Lord had filled the sky with radiance. Now the glory of God was gone and the shepherds and the sheep stood under dim starlight. The men were shaken by the wonders they had seen and heard and, the sheep stood under dim starlight. The men were shaken by the wonders they had seen and heard and, like the animals, they huddled close. "Let us now," said the eldest of the shepherds, "go even unto Berthlehem, and see this thing which has come to pass, which the Lord hath made known unto us." The city of David lay beyond a far, high hill, upon the crest of which there danced a star. The men made haste to be away, but as they broke out of the circle there was one called Amos who remained. He dug his crook into the turf and clung to it. "Come," cried thr eldest of the shepherds, but Amos shook his head. They marveled, and one called out, "It is true. It was an angel, You heard the tidings. A Saviour is born!" "I heard," said Amos, "I will abide." The eldest walked back from the road to the little knoll on which Amos stood. "You do not understand," the old man told him. "We have a sign from God. An angel commanded us. 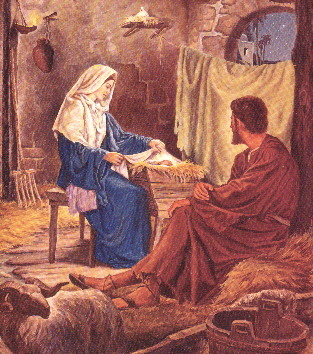 We go to worship the Saviour, who is even now born in Bethlehem. God has made His will manifest." "It is not in my heart," replied Amos. And now the eldest of the shepherds was angry. "With your own eyes," he cried out, "you have seen the host of heaven in these dark hills. And you heard, for it was like the thunder when 'Glory to God in the highest' came ringing to us out of the night." And again Amos said, "It is not in my heart." Another shepherd then broke in. "Because the hills still stand and the sky has not fallen, it is not enough for Amos. He must have something louder than the voice of God." Amos held more tightly to his crook and answered, "I have need of a whisper." They laughed at him and said, "What should this voice say in your ear?" He was silent and they pressed about him and shouted mockingly, "Tell us now, What says the God of Amos, the little shepherd of a hundred sheep?" Meekness fell away from him. He took his hands from off the crook and raised them high. "I too am a god," said Amos in a loud, strange voice, "and to my hundred sheep I am a saviour." And when the din of the angry shepherds about him slackened, Amos pointed to his hundred. "See my flock," he said., "See the fright of them. The fear of the bright angel and of the voices is still upon them. God is busy in Bethlehem. He has no time for a hundred sheep. They are my sheep. I will abide." This the others did not take so much amiss, for they saw that there was a terror in all the flocks and they too knew the ways of sheep. And before the shepherds departed on the road to Bethlehem toward the bright star, each talked to Amos and told him what he should do for the care of the several flock. And yet one or two turned back a moment to taunt Amos, before they reached the dip in the road which led to the City of David. It was said, "We shall see new glories at the throne of God, and you, Amos, you will see sheep." Amos paid no heed, for he thought to himself "One shepherd the less will not matter at the throne of God." Nor did he have time to be troubled that he was not to see the Child who was come to save the world. There was much to be done among the flocks and Amos walked between the sheep and made under his tongue a clucking noise, which was a way he had, and to his hundred and to the others it was a sound more fine and friendly than the voice of the bright angel. Presently the animals ceased to tremble and they began to graze as the sun came up over the hill where the star had been. "For sheep," said Amos to himself, "the angels shine too much. A shepherd is better." With the morning the others came up the road from Bethlehem, and they told Amos of the manger and of the wise men who had mingled there with shepherds. And they described to him the gifts; gold, frankincense, and myrrh. And when they were done they said, "And did you see wonders here in the fields with the sheep?" Amos told them, "Now my hundred are one hundred and one," and he showed them a lamb which had been born just before the dawn. "Was there for this a great voice out of heaven? asked the eldest of the shepherds. Amos shook his head and smiled, and there was upon his face that which seemed to the shepherds a wonder even in a night of wonders. "To my heart," he said, "there came a whisper." Taken from AN AMERICAN CHRISTMAS Ideals Publications Incorporated, Nashville, Tn 1996, pages 154-155. Picture, A SHEPHERD, from COLLECTED EDITION OF HEYWOOD BROWN by Heywood Brown. Copyright 1941 by Heywood Hale Brown. Used by permission of the estate.